Preheat oven to 200°C/180°C fan forced. To prepare the ingredients, roughly chop the parsley and coriander, finely chop the brown onion, peel and crush the garlic, zest and juice the lime, deseed and finely chop the long green chilli, cut the zucchini into ribbons, cut the haloumi into 5 mm thick slices, thinly slice the apple and wash the mixed salad leaves. In a blender or food processor combine the parsley, coriander, brown onion, garlic, lime zest, lime juice, long green chilli, olive oil and red wine vinegar. Blend until well combined. Season to taste with salt and pepper. If you don’t have a blender or food processor finely chop all of the ingredients and then mix them together. Meanwhile, heat a large chargrill pan over a medium-high heat. Lightly spray with olive oil and cook the zucchini for 2 minutes on each side or until chargrilled. Remove and set aside. 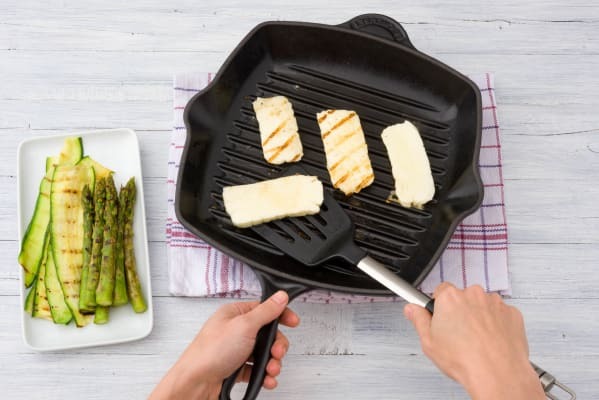 Add the haloumi slices and cook for 1-2 minutes on each side or until golden. 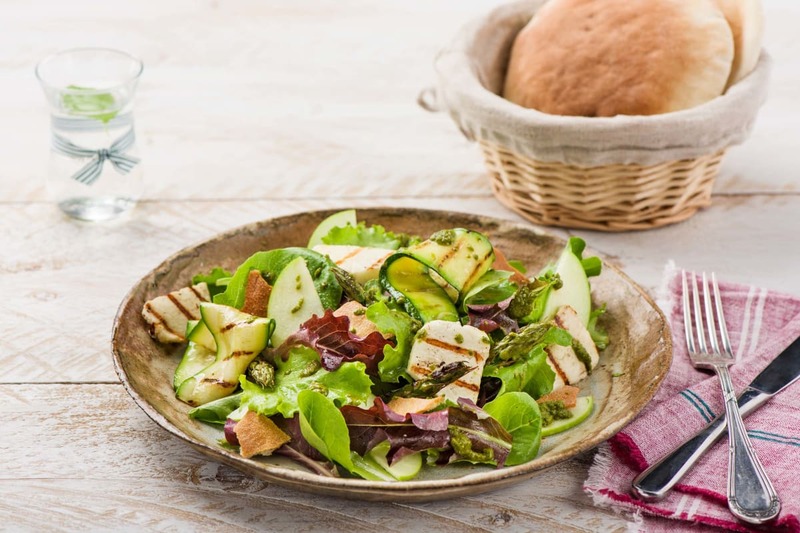 In a large bowl, combine the apple, mixed salad leaves, zucchini, and Lebanese bread shards. Gently fold through the haloumi slices. Divide the salad between plates and drizzle with the chimmichurri dressing. Tip: If you have remaining chimmichurri dressing, you can keep it in a glass jar in the fridge for up to 2 days.